Hello, I've been super busy with illustration work this summer, I think I caught a glimpse of the sun out of the window but I might have dreamt it in the couple of hours sleep I got back in July. The summer also saw the release of two fiction titles which I illustrated earlier this year, HENRY HUNTER & THE BEAST OF SNAGOV written by John Matthews published by Templar and DRAGON SHIELD by Charlie Fletcher and published by Hodder. I'm really chuffed to have my work published and to see them out there ( available now in all good bookshops! ) it's the realisation of a long held ambition. I'm currently working on illustrations for the sequels to those two books and burning the midnight oil one again, the search for music to keep me working late into the night led me to the Philadelphia based band The War on Drugs and their recent release Lost in the Dream. Here's the video to the single Under The Pressure, I know how they feel! Here's the cover and some illustrations from HENRY HUNTER and DRAGON SHIELD, I'll write more about them at some point. Here's the melancholy cast of The Hobbit making their way home after a heavy night on the town... ok it's not, it's actually a group of Icelandic singers called Arstioir performing an 800 year old Icelandic hymn in a train station in Germany, I like it very much, it's beautiful. Hello, it's been blimmin ages since I wrote a blog, I've been so busy these past couple of months cross hatching away on some very exciting projects! I was working on illustrations for two books (which I promise to blog about shortly) I did manage to have a little break in-between and Clare and I were fortunate enough to take a trip to New York and Philadelphia. We roamed the not so mean streets of New York in search of inspiration for future illustrations/works of art, it's such an exciting place it's hard not to be inspired although I was a bit sad to see a few shops and diners I had visited on my previous trip 11 years ago had gone and lots of bland chains had popped up... everywhere! We caught the train to Philadelphia (which is about an hour away from the NYC) to visit the Rosenbach Museum And Library. The Rosenbach is home to the work of one of my illustration heroes Maurice Sendak. The collection of Sendak's work is rotated in themed exhibitions, when we visited it was called The Night Max Wore His Wolf Suit: 50 Years of Wild Things, I couldn't have been more excited! The exhibits included manuscripts, preliminary drawings, mock-ups and originals from Where the Wild Things Are. The Wild Things are kept in glass cases to stop them causing a rumpus! It was amazing to see the original illustrations, a wonderful opportunity to fully appreciate the quality of Sendak's draughtsmanship, delicate pen work and beautiful washes of colour. Philadelphia had a similar feel to Manchester and the industrial north of England, factories and rows of houses dominated in the suburbs. I read that the film-maker David Lynch lived and studied in Philadelphia for a number of years and it that it had made a great impression on him, particularly with regard to Eraserhead and The Elephant Man, the hiss of a piston and the hoot of the factory whistle n'all that! Anyway, here are a few photographs I took in Philadelphia and New York which I'll use as inspiration one day. More evenings of lamplit cross-hatchery ahead of me. I'll put some of the illustrations I've been working on recently on this 'ere blog soon, It's about time I put some of my work up rather than just banging on about music! It's coming up to 11pm and I'm about to cross-hatch/ink-in an illustration of a restaurant that has just been visited by vampires. If my brain was to start singing it'd sound something like this track by Tom Waits. Happy listening folks, sweet dreams! I've been putting in the hours on an exciting project recently. I'm working on illustrations for a children's book that has vampires in it, those poor vamps don't get out much during the day, I'm beginning to know how they feel! So, a deadline looms and the daytime flies by and I work late into the night. I quite like working at night, I put the lamp on and crank up the ipod and I'm in a world of my own. Winter nights need winter music, Kolniour from the album Go by the Sigur Ros frontman Jonsi has a suitably wintery feel to it. I saw Jonsi perform this song in Leeds a few years back and I shall never forget it, this 'live' video I've put up doesn't really do it justice (not to say it's bad, far from it, you just had to be there i think) The animation from the video played on a large screen behind the band and the music was wonderfully loud. It was an amazing gig with fantastic production and visuals. I love this track, it's just right for a dark winter's night. In the run up to Christmas Waterstones in Brighton played host to my illustration hero Raymond Briggs. I'm currently working on illustrations for a very exciting project (coming summer 2014) and so between that and my other commitments I was an exceedingly busy chap and unable to travel down to the South coast to attend this very rare opportunity to meet Mr Briggs. To say I was disappointed not to attend is an understatement. It would've been wonderful just to shake his hand and to say thank you. I pondered and agonised as to whether I should make the trip but I felt I just didn't have the time. I resigned myself to the fact that I couldn't go and promised that I'd do everything I could should the opportunity arise again in the future. I was cheered up by watching 'The Snowman' and the newer 'The Snowman and the Snowdog' but little twinges of regret remained, and then in the evening of Christmas day something wonderful happened...on returning home from family visits my partner presented me with one more package. Knowing how disappointed I was not to be able to go down to Brighton, Clare had contacted Waterstones and asked if it would be possible to get a signed copy of The Snowman. The fantastic staff at Waterstones very kindly followed up Clare's request and even better than that they managed to get it dedicated to me! It was Christmas magic. So, a big thank you to Watersones in Brighton, it really was very kind of you, a big thank you to Mr Briggs (I'll do my best to thank you in person one day!) and last but not least a huge thank you to Clare, I couldn't have asked for a better present. Happy Christmas and a big thank you to everyone who has followed and supported my work this past year. Next year promises to be a very exciting one for me so watch this space! 'Aventine' by Danish singer/songwriter Agnes Obel is an album full of beautiful songs which for me perfectly soundtrack a frosty autumn/winters day. I travelled to York by train recently and listened to this album as lovely autumnal sun lit up the passing fields, trees and churches, it was splendid! You can see Agnes performing the very lovely song 'Dorian' below. And finally...can somebody help me, I can't stop reading this book, I'm sure it's not good for me! It's my birthday today, to celebrate here is a spooky new video from the wonderful Mr David Bowie, I still can't believe he's back and looking so well! Happy Halloween folks. The Cocteau Twins are sadly no more having disbanded in the late 90's but they left us with a terrific back catalogue. Formed in Grangemouth, Scotland in the late 70's they created several albums of post-punk/dream pop loveliness. I love them, an ideal accompaniment to an evening of cross-hatchery. So many beautiful songs...this is called Bluebeard it's taken from the album Four-Calender Cafe (Fontana, 1993). The Cocteau's were often reluctant to appear in videos but here they pull out all the stops and give the camera some proper moody pop star looks! Hello, it's been a while since my previous 'Heroes' blog, I've been burning the midnight oil busily producing some illustrations for an exciting project which I'll write about in the near future, watch this space! Today I'm writing about the wonderful work of the Australian illustrator Shaun Tan. Sometimes a book, a song, a film or whatever it might be can appear seemingly out of nowhere and help us to look at the world and our place in it a little differently, for me one of those occasions was brought about by the discovery of The Red Tree by Shaun Tan. Children's books allow readers young and old an opportunity to stretch their imaginations, to run wild, to be silly, to visit a world populated by big friendly giants, to see what a bogeyman does for a living or to watch a big gloopy alien attempt to press a grundledorfer (we have Neil Gaiman and Chris Riddell to thank for the last one!). Sometimes children's books also show us that life isn't always shiny and happy, hello The Red Tree . I mentioned in a previous blog that Tove Jansson had a wonderful way of writing very quietly about life's challenging periods, she wrote with great charm, subtlety and wisdom. For me The Red Tree has a similar quietness. The illustrations are out of this world, surreal, a little scary and beautiful. The Red Tree explains that life can be difficult with many thoughts and feelings to deal with but hang on in there, and you'll find something worthwhile. I love the work of Shaun Tan, from The Arrival and The Lost Thing to The Rabbits , they're all bloomin lovely. Another author/illustrator I'd like to shake hands with and thank. I'm happy just to share half a surname with him! I also recommend the fantastic Oscar winning animation of his book The Lost thing , it's splendid. The nights are drawing in and a hint of autumn hangs in the air. I'm switching the lamp on my desk on earlier every evening and with it I'm seeking out the music that will provide the perfect soundtrack to my forthcoming evenings of autumnal cross hatching. This song is called Solin mun skina it's from the album I Annan Heim by the Reykjavik based band Rokkurro. Hello, following on from my previous post about how I create one of my cross hatched pictures I thought it'd be good idea to start with my tools of the trade...Pens. It's taken me many years of trial and error with various pens in the search for one that is suitable for my cross hatching needs. I have searched far and wide for a pen that combines a fine line with a good quality ink density. Some pens 'bleed' too much, some are too scratchy, others just don't 'feel' right. I believe it will be an ongoing search, sometimes I think I've found the pen of my dreams only to find the naughty manufacturer tinkers with the design throwing me into a world of pen chaos! At the moment I'm very happy with the pen I'm using, I found it on this lovely website, you can find the details here - Cult Pens provide an excellent service, always fast, friendly and efficient, I recommend them. I tend to use a 01 pen, it produces quite a fine line which I then build up with my cross hatching technique, time consuming but nice. So there you have it, I'm a pen geek. In my next post I'll do my best to show you how I produce one of my illustrations. I have retitled Woerner's Liquor Store, it's now titled Hotel Hartland, San Francisco and it will be in black ink not colour as I thought that would be the best way to demonstrate my technique. Hello, I've spent the past couple of days sketching away on this drawing, next up is the fun part...adding the cross hatching pen work! I'm going to attempt a colour cross hatching technique using Isograph pens and liquid acrylic inks. It's a time consuming process but it's one I really enjoy, it's a very relaxing and peaceful way to create my illustrations (apart from when it goes wrong!). I'll put a few more posts up explaining the various stages of producing the illustration and hopefully produce a nice new picture in the process. I'm not worried about giving the secrets of my technique away, I'm sure most sensible folks will be outdoors enjoying the lovely summer sunshine! Having previously blogged about the three author/illustrators whose work ignited my passion for a finely crafted children's book/graphic novel under the banner of 'Heroes', I now welcome you into my 'World of Illustration'. It's a world filled with Hattifatteners and Hemulens (Tove Jansson) Lost Things (Shaun Tan) and Gigantic Evil Beards (Stephen Collins) and many other wild and wonderful creations. If Maurice Sendak, Tove Jansson and Raymond Briggs are at the centre of my illustration world then these are the artists and author/illustrators who orbit that world! Carson Ellis is a Portland (Oregon) based illustrator whose work I love. I first came across her illustrations in Colin Meloy's Wildwood (Colin Meloy is the frontman of the popular indie/folk rock band The Decemberists and the husband of Carson Ellis) a couple of years back. These beautiful illustrations have such a strong sense of place , they're highly stylised yet it's possible to almost feel the cool mists and darkness hanging in the tall lonely Pine trees of the Pacific Northwest. These dark forests are inhabited by besuited Foxes and monocle wearing Owls in an epic tale of magic and warring animals. I love the use of muted colours and the off kilter approach to drawing buildings and trees, if Grandma Moses had had a crack at illustrating The Wind in the Willows it might have looked something like this! 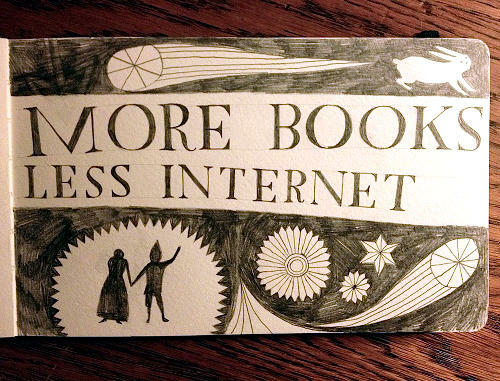 Here's a nice little picture by Carson Ellis with a motto I'd like to think I follow! Tove Jansson with her Moomins in 1956. Photograph by Reino Loppinen. Ok, so today I'm totally contradicting what I said on my very first 'Heroes' blog about the no order/list thing, it seems I just can't stop myself! For me there are three author/illustrators who's work has proven to be a constant source of inspiration and reward. Joining Raymond Briggs and Maurice Sendak in my 'top three' is the wonderful Tove Jansson. Why Tove Jansson? well, once again my fondness for this author/illustrator's work has it's roots in my childhood, though my introduction to her work wasn't through reading books in the library, it came via the magical medium of television, specifically the beautiful, peculiar and charming stop-motion animated version of Jansson's most famous work 'The Moomins'. This programme initially aired in the early 1980's. I wasn't very young at this point but young enough to be mystified, enchanted and a bit freaked out by those odd tales about a family of...well who knows what they are? living in a remote valley by the sea. My initial bewilderment gradually gave way to a love of all things Moomin, I moved onto the books themselves, they were beautifully written and illustrated with delicate line drawings of lighthouses, mountains and cosy family scenes. I was intrigued by tales of the Groke, of SnorkMaiden and Fillyjonks, these were stories that fired the imagination and conjured up images of misty forests and icy landscapes. I've read these books many times and on each reading I'm struck by Tove Jansson's quiet and sensitive storytelling, they're full of wisdom and knowledge. The themes are big and occasionally dark and it often seems the gloom could be too much for young minds, but for me that's the beauty of Tove Jansson's writing, she quietly explains that life isn't always full of sunshine and happiness but with the help of friends and family the scary and sad things can be dealt with and that even Grokes get lonely! The publisher Sort of Books recently published a lovely edition of Tove Jansson's first Moomins book The Moomins and the Great Flood , it's a beautiful book and in my opinion contains the finest examples of Jansson's illustrations. Here are the opening titles of the Moomins animation, the music still haunts me! I said in my previous 'Heroes' blog that I wasn't going to put them into any particular order and I'm sticking by that but I just couldn't resist putting the great (and sadly late) Maurice Sendak here. I suppose it's safe to say that the work of Maurice Sendak and Raymond Briggs has been the biggest influence on my own. As I mentioned in my first blog, it was those trips to the local library way back in the 70's that ignited my passion for picture books and illustration. Harking back to my early childhood in that 'brown' decade of flares, bowlcuts and chunky jumpers it's easy to see why picture books had such a profound effect on me, especially Where The Wild Things Are and In The Night Kitchen. Those two books were so different, so unusual and so scary! Even now I get a peculiar feeling when I look through them. Everything about them made them stand out from other books, the colour palette was quite subdued and sophisticated for children's books and the characters were from a different world entirely! Those 'Wild Things' are so strange, a bit like the pictures you make in the drawing game where somebody draws the head and then folds the paper and the next person draws the body and so on until you end up with a dog-robot in slippers or some such, perhaps that's how Maurice Sendak came up with the Wild Things? how else would he have come up with a horned monster in stripes with feather legs?...called Carol! In the Night Kitchen has equally strange elements, including multiple Oliver Hardys (from Laurel and Hardy) and Aeroplanes made out of dough. The illustrations are beautiful in both books ( indeed in all of his books) and Maurice's use of cross-hatch was a revelation for me! Ten years ago I was fortunate enough to meet the great man in person. I was on holiday in New York and having purchased a copy of the New York edition of Time Out magazine to plan my week ahead I was overjoyed to see that Maurice Sendak was to give a talk at Barnes & Noble to promote his new book Brundibar along with the playwright Tony Kushner , that very week! I went along to the bookstore on that chilly November evening and sat with my mouth agape as Maurice talked about his life and career and then signed copies of Brundibar, Maurice Sendak, there, in front of me! When it was my turn to meet him and have my book signed I simply shook his hand and thanked him and then scarpered off into the wintery streets of Manhattan, happy as larry! It still seems a bit unreal but it's a moment I'll always treasure, after all, it isn't everyday you get to meet one of your heroes. The Time Out cutting and my treasured signed book! Here's the lovely new single Another Tale From Another English Town by the Newcastle based band Lanterns On The Lake. I came across them when they supported Yann Tiersen at the Brudenell Social Club in Leeds a couple of years back. They have a new album called Until The Colours Run coming out in September which feels perfect as they sound very autumnal and starry to my ears, I can't wait, just right for evening cross-hatching! This is the first in what I hope will eventually be a long list of artists, illustrators and authors who's work has inspired, informed, motivated and driven my own creative endeavours. These are my heroes. I'm not intending to put them into any particular order, just whoever pops into my head as I begin bloggerizing. Having said that I'm kicking off with a chap whose books and illustrations have always been with me - Raymond Briggs. I wasn't a big reader as a child, I much preferred picture books. My mum regularly took me and my brother to Carnegie Library at the bottom of our road and we would make our way past the room full of old men reading the daily newspapers, I'd manoeuvre my flares into a comfortable position and sit, looking at the picture books. There were one or two that I would seek out on every visit (and be mortified if they weren't there!) they were Fungus the Bogeyman, Father Christmas and Father Christmas Goes on Holiday (as well as Where the Wild Things Are and In the Night Kitchen by Maurice Sendak but I'll get onto those in a later blog!). I loved the illustrations in those three books, they had a familiarity about them, you could look out of the windows and recognise the landscape that Raymond Briggs had drawn, not necessarily the northern landscape I lived in (Raymond Briggs lives in the south of England in the Sussex countryside) but a very English one, one filled with chimneys, lampposts and row upon row of houses and folks traipsing off to work under gloomy grey skies, I was a cheerful kid!. The books were filled with little details that you could pick out and discover new ones when you next looked, and who wouldn't want to read about the nocturnal adventures of a Bogeyman or a miserable Santa?! All of this was illustrated in beautiful washes of paint, pen & ink and coloured pencils and told in sequential style like a comic book, a style rarely seen in Children's books in the 70's, bloomin lovely! Those books and the subsequent titles released by Raymond Briggs have continued to captivate and inspire not only myself but generations of children and illustrators. 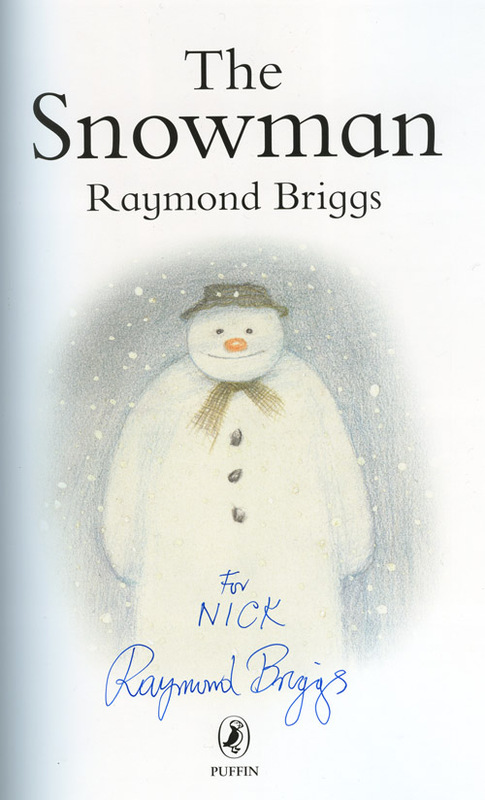 It's an ambition of mine to meet Raymond Briggs, to shake his hand and thank him for creating such lovely books. I guess it's unlikely that will happen so I'll say it here, 'Thank you Mr. Briggs'.